It might be the case that, the next official release of GStreamer package will be available after a month or two, but you need the package based on the latest code repository. If we are on the same page, let’s start to build the GStreamer framework for iOS (as well as for Mac OSX). The procedure is same for other OS. That means, If you would like to build for Windows, you can use a Windows machine. Of course, iOS and Mac OSX framework can not be built from Windows, in case you were wondering. Download the git repository using your favorite git client or from command-line. You might want the build for any particular architecture according to your need. Or, you can go for universal build. Please note that, in either case you will get the corresponding Mac OSX package. It is very common that you have a multi-core processor system. If you would like to make the build process faster then you have an option to involve all cores to the build process. I had asked the question in their forum and got the response from Andoni. To make it work, do as follows, Go to the code location using Finder (File Explorer). This simple edits will allow the build process to make use of all the cores as well as all hyper-threads, which will enable the process to run much faster. The processing power is required most at compile step. 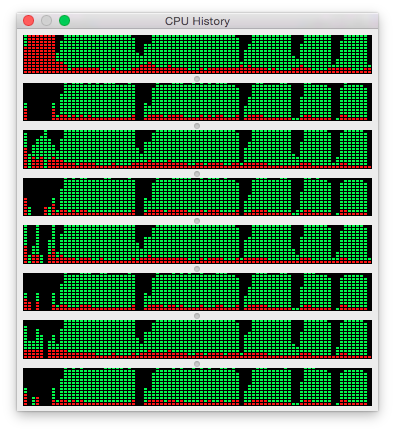 This is the screenshot of the CPU history of my MBP in an arbitrary plugin compile step. You can see, all the cores and hyper-threads are in use at their fullest capacity. My MBP specification is, 2.3 GHz Intel Core i7 with 8 GB 1600 MHz DDR3 RAM. As a sidenote, I am using Yosemite (10.10.1) and I have experienced that it makes lesser halts and errors during the build process as opposed to Mavericks (10.9); Although I do not have any proper reasoning and it is quite possible that, this happens only in my case. Now you will be asked for the password. After providing the password, it might take 2/3 hours to complete the process, depending on your internet and processor speed. It is even a longer process and might take up 8-9 hours for universal build and 2-3 hours for a single architecture build. Basically, it will download 84 different plugins and each of these plugins will go through the same 6 steps with one more additional step. Good news is, if for some reason the process halts, (might be an internet connection issue or any error) you will have an opportunity to run again from the failed step. In such cases, first try out enter 2, which is Rebuild starting from the failed step. If doesn’t work then try out enter 1, which is Rebuild the recipe from scratch. If doesn’t work, look for and try to figure out the specific error message from the bunch of error text above the 5 options text. I’m playing aac audio stream on my iOS device using GStreamer SDK, its working fine, but delay is above 2.0 seconds. Can I make this delay lower then 2.0 seconds? There may be some buffering issue.